We’d love your help. 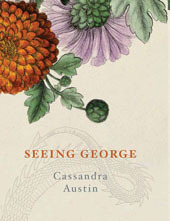 Let us know what’s wrong with this preview of Seeing George by Cassandra Austin. To ask other readers questions about Seeing George, please sign up. A odd story but quite charming. Still not sure exactly how I felt about it! Beautiful looking book, but for me that was where it ended. The characters didn’t seem to have enough depth to be believable or feel much for them. Engaging and charming. Couldn't put it down! I can't wait for her next book to be released! A sweet fairytale, not to be read with logic but with the heart. A young woman trapped in an unsatisfying marriage meets a man at work who she sees as a dragon, tail and all. They maintain a platonic relationship for many decades until her death, under the watchful eye of her jealous husband. I usually don't like fairytale-type books - I prefer people to say what they mean rather than having to interpret it - but I did enjoy this one. It must have been the writing style and certainly I enjoyed th A sweet fairytale, not to be read with logic but with the heart. A young woman trapped in an unsatisfying marriage meets a man at work who she sees as a dragon, tail and all. They maintain a platonic relationship for many decades until her death, under the watchful eye of her jealous husband. There's a good story somewhere in this novel. It's a little more sophisticated than it initially seems. The writing lacks somewhat, an odd mixture of old fashioned and immature. The structure works eventually, with an interesting conclusion. The book is engaging enough and with time and experience this author might develop some intriguing work. The hardback copy is beautifully presented. I really enjoyed this quirky story of a married woman who sees a magical dragon in a work colleague while all others just see a man. Made me think about how much of love is really just truly seeing and being seen. A small cast of characters and austin does domestic detail with a light touch that never gets mundane. A great portrayal of a close marriage moving towards one partners death. An adult fairytale weaving between past and present in alternate chapters. Proving that some have the ability to see things that others cannot or will not. This book goes to show that magic does exist and if you see it, smile and enjoy it as you don't have to prove it to the ones that can't. It is hard to get but well worth the effort. It is set in Melbourne, Victoria. I would love to hear other peoples opinions. Whimsical, charming and thoroughly modern fairy tale. What an odd little piece! Not sure about this one, kept with it - mainly due to the tenacity and endurance of one of the characters. Am intrigued, can you see dragons too? Born in 1969, Cassandra Austin grew up in outback NSW but completed her formal education at Melbourne University with an MA in Criminology. She also has an MA in Creative Writing from RMIT. Austin has previously written one novella, Seeing George, published by Random House in 2004. Her latest release, All Fall Down will be released in 2017. She currently lives in Los Angeles with her husband and ch Born in 1969, Cassandra Austin grew up in outback NSW but completed her formal education at Melbourne University with an MA in Criminology. She also has an MA in Creative Writing from RMIT. Austin has previously written one novella, Seeing George, published by Random House in 2004. Her latest release, All Fall Down will be released in 2017.